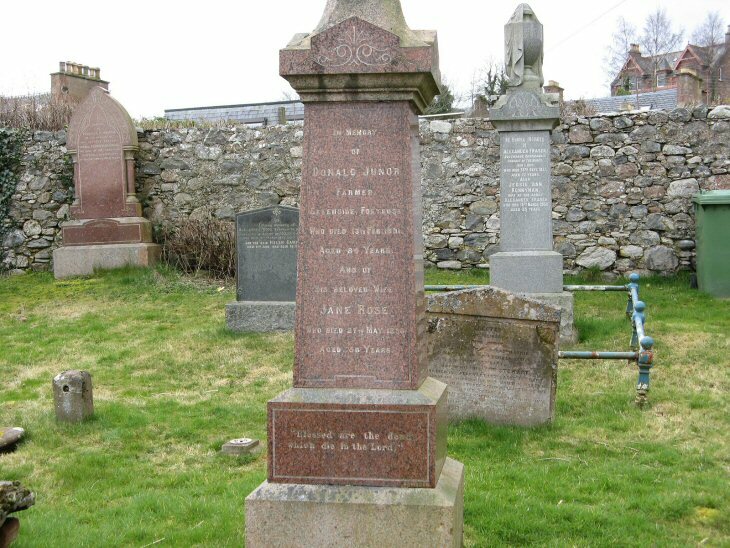 In memory/of/DONALD JUNOR/farmer/Greenside Fortrose/who died 13th February 1891/aged 84 years/and of/his beloved wife/JANE ROSE/who died 27th May 1898/aged 56 years. "Blessed are the dead/which die in the Lord." Also their eldest son/JOHN JUNOR/chemist/who died at Edinburgh/19th June 1929/aged 63 years/their eldest daughter/CATHERINE ISABELLA/died 4th March 1953/aged 84 years/their second daughter/ANDREWINA,SRN/died 18th July 1952/aged 83 years. Picture Added on 22 May 2008. Added by Fiona on 11 July 2018. Thank you Fiona & for the Robert Mustard correction. Added by Roddie Macpherson on 22 July 2018.